In the morning, four female engineers shared their career path & experiences with the young girls. Lydwine Rulha, Signal processing engineer, gradutated from the digital technology engineering school (ISEP), skilled in drones sensors: how integrate them, where are they located, and how they move. Soumaya Chérifi, Project manager of the propulsion team, dealing with drones modelling (autonomy and higher speed), mechanics, electronics, algorithm et camera, etc. Cairan McCaroll, native from Scotland, this aeronautical engineer & project manager has always been passioned about planes. 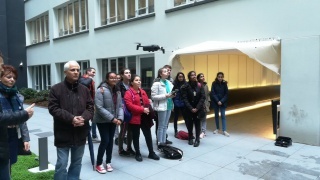 In the afternoon, the students visited the CEL lab to realise frequency mesures, check if the product is reliable and do not issue electronic noises, because the drones create waves. Then, the girls attended tests, attempts and drones preparation, as well as the introduction of a 3D printer. Finally, they discovered the wind-tunnels for the mechanic parts and the wind control for tests, before to finish with a drone piloting session!